Making this quilt was such a learning experience. I learned how to piece 9-patch blocks and how to snug the seams so they would match up. I also learned quick-piecing methods that made it work up really quickly. It was the first time I did any amount of machine quilting (not counting stockings) and first time I used clear thread-which may not sound like a big deal but it's different using it. It's also the first time I used quilting software (at the time I only had Quilt Design Wizard but I use Electric Quilt now) which I used to figure out color placement. At the time I swore I would never do another pieced backing like this. I still may not-it was a lot of work. And honestly, I am totally not up to the caliber of all the other quilters participating but thanks to all the great blogs, magazines and my prior experience sewing clothing and crafts, I'm learning! I really Love your quilt! It's a sheer delight! Very cute. I love pieced backs. It just looks perfect to me - and is just precious! Love it. I know they are alot of work - but just look at the end result! Gorgeous. I've spent the last two hours looking at Blogger's Quilt Festival posts, and yours is as good as any of them. It's bright and fun and well made - and you put a lot of work even into the back! Nice job. I just love this...I love cats and you did an awesome job with this. Also love the back of it...I love interesting backs. Delightful! 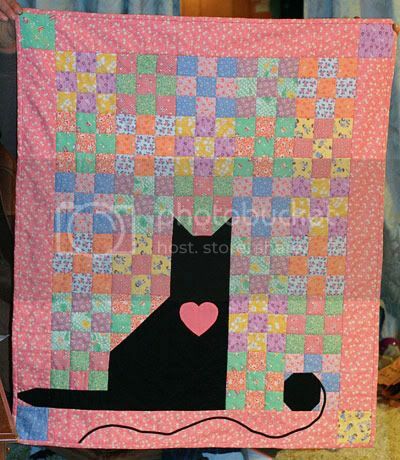 I really like the black kitty against the beautiful 30's repro fabrics. That pieced back is nearly as pretty the front. You may be slow (so am I!) but your work is excellent. Your quilt is great so don't be hard on yourself - no quiltzillas here! 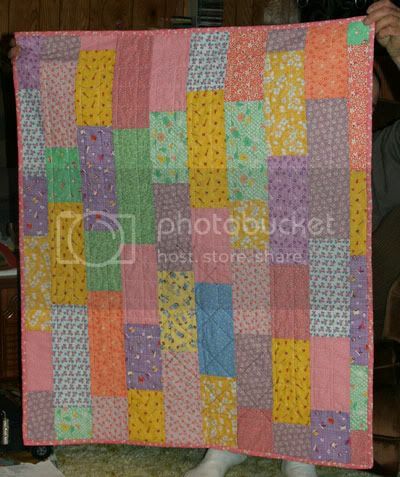 All that piecing was well worth it, you have two quilts in one! Beautiful! I am in the process of learning how to quilt but seem stalled at having enough motivation. So for now I greatly admire the work of those who do it. :) Great job! This looks phenomenal!!! LOVE the cat with his ball of yarn! The back does look like a lot of work. You are a great seamstress!